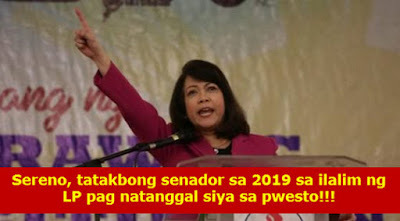 Supreme Court (SC) Chief Justice Maria Lourdes Sereno will run for senator in the 2019 midterm elections under the Liberal Party (LP), if she will be removed from office either through impeachment or the quo warranto petition. This is according to Ifugao Representative Teddy Baguilat Jr., who is also LP’s vice president for internal affairs. “I think CJ Sereno has already accepted whatever the outcome of the impeachment and quo warranto cases will be. So this early, she is preparing to pursue a career in public service to really fight for the oppressed like her.” Rep. Baguilat told reporters on Thursday, April 12, adding that her name is already in their senatoriables in 2019. “Once she runs for senator and win, which we at LP strongly believe that she will win, it will be a solid proof that she is innocent and that (President) Duterte is wrong. In fact, his purpose to oust the Chief Justice is to remove everyone who opposes his evil decisions, and this includes replacing VP Robredo with Bongbong Marcos.” He added. “I am now your enemy. You have to be out of the Supreme Court,” President Duterte said during a press briefing at the Davao International Airport last Monday before leaving for China, adding that the impeachment against Sereno could proceed at the same time that the SC is hearing the quo warranto petition filed against her. “I am asking Speaker (Pantaleon) Alvarez now (to) kindly fast track the impeachment process. She is bad for the Philippines. I have said that I don’t want to meddle. I was patient. But this time I am asking the congressmen and the Speaker to do it now,” the president added. The next day, CJ Sereno responded and criticized President Duterte. “You have heard the pronouncement of the President. I was just asking a question that actually needed to be answered: why the Solicitor General was devoting resources of the government to oust a sitting justice through a quo warranto petition? You heard his answer. His answer betrays the entire story. One man rule already is here.” She said.